A kitchen is incomplete without a pressure cooker. While it may look like a standard cooking pot, it is actually loaded with a number of features that finish the cooking process quickly and easily. 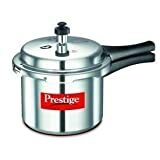 If you are looking to buy a pressure cooker, Prestige 5lts Pressure Cooker can be a great choice. Prestige is already a famous brand and is known to manufacture products that are highly functional, reliable and affordable. 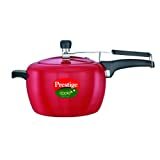 The pressure cooker is made from virgin aluminium to offer a high level of safety and functionality. For enhanced safety, the cooker features a gasket-type release system. Handles are attached to the cooker with the help of two screws for enhanced strength. 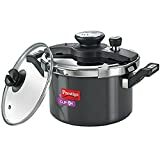 If you are looking for pressure cooker from other brands, Presto, Hawkins, Pigeon, Surya, and Premier are some other brands which you can consider.